Or not. At all. One of the things I have learned in recent years is that I have limits. In college I pretty much thought I could do anything. And I mostly did, until I drove myself so hard I melted down. And then I’d start all over. Years of therapy later, I realize I can’t do everything (for myself and for everyone else) all the time, nor should I. Especially as a mom and a small business owner, there is always, always, always something (or many things) left undone. And you just have to be ok with that. Or at least not cry about it. So while I do have many ideas to blog about, most of which I usually discard before I have the chance to write the first word, and I appreciated the challenge of trying to write every day in November, I’m giving myself permission to stop. Doing all the things that are theoretically supposed to happen in a given day, like cooking healthy meals, getting work done for clients, taking care of my daughter, exercising, interacting with my husband in some pleasant way, and taking care of general errands and things that need taking care of, plus blogging, is pretty much impossible for me. Perhaps it is possible for some. But another thing I’ve learned is that I have to give myself some time to relax, whether it’s reading, doing yoga, or watching a show. And blogging, while often fun, is putting something out there–it’s work–and not taking something in. Some days I’m lucky if I get any of the aforementioned items done, much less all of them. Today my daughter was home sick, so my main accomplishment was keeping her (and me) from going insane. Not even sure I achieved that. But she’s asleep now, and still alive, so I’m going to pat myself on the back. Saturday night my husband surprised me. We have a long tradition of planning mystery dates for each other, often for special occasions or as the result of a bet. But sometimes we are just inspired by an opportunity that comes along. A friend of mine remarked that he is impressed by how we are able to do these things for each other and “keep the magic alive.” I am thankful that we are committed to this and feel like it’s absolutely necessary. If we didn’t do lovely things for each other sometimes, we would go insane. These outings remind us why we love each other and that there’s more to life than paying medical bills and playing pretend with our daughter. But usually I am a good guesser and it can be hard for my husband to keep his plans a complete mystery. Saturday, however, he had arranged for Zoe to have a sleepover at my parents’ house, and had orchestrated our afternoon so we dropped her off by 4pm. I thought because of the hour we were going out of town. Then he was trying to figure out the best route from my parents’ house to our destination. He mentioned Mt. Vernon so then I thought we were going to or near George Washington’s house, which seemed like an odd choice for a date. But then he said Mt. Vernon Avenue, and I knew we were going to the Birchmere. 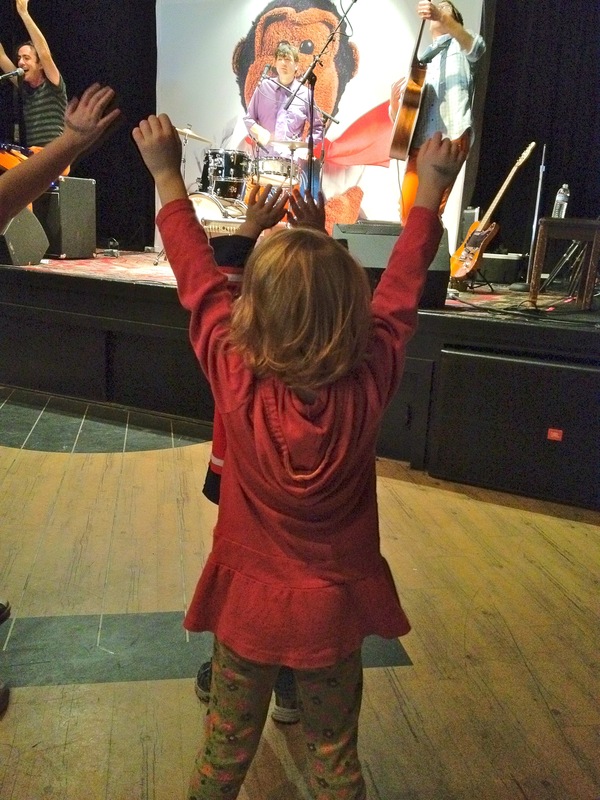 I have seen dozens of concerts at the Birchmere and never been disappointed. Eddie from Ohio, Cheryl Wheeler, Bela Fleck and the Flecktones, Sweet Honey in the Rock, Hem, Greg Brown, Cry Cry Cry, and a bunch of other amazing artists. 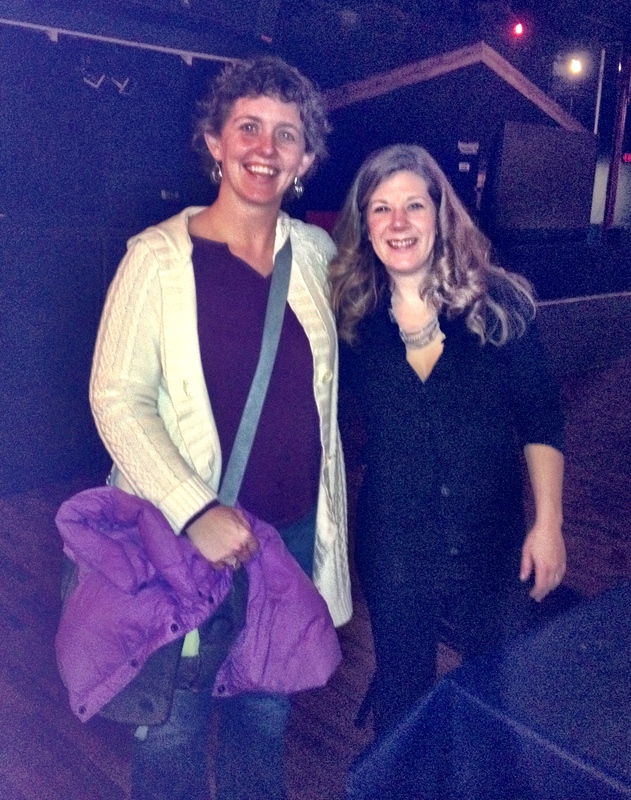 And I have on many occasions seen Dar Williams. She is one of my favorites. I have all her cds. So I was totally surprised when we drove into the Birchmere parking lot and the marquee read DAR WILLIAMS. Not surprised that Randy would take me to her show, but that I had no idea she was in town. I didn’t know she was touring. I was thrilled and totally impressed by my husband’s stealth and cleverness. The show was wonderful. The Birchmere, which has historically served terrible food that you are more or less forced to eat because if you get there early enough to get a good seat, you might as well eat, has gotten a new chef or at least a new menu. We had great meals. The opening act was the Sweater Set, who I had never heard of but were fun and talented and played the flute and glockenspiel, among other instruments. And Dar’s set was wonderful. She played new songs and old songs and songs in between, and told her trademark weird little stories in between. She brought her guitar and a piano (and pianist to play it) so the music was pared down to its essential goodness and not overwhelmed by a drum set. And best of all, afterward she came out into the lobby to talk with fans. We waited in line for a while and when it was our turn I told Dar about how the role her music played in our early courtship. When Randy placed the personal ad on WashingtonPost.com that he was required to post in order to respond to my ad, he mentioned that, if a first date went well, he might take someone to the Dar Williams show at the 9:30 Club on April 19. It turns out that our first date and our second date and several consecutive dates went sufficiently well that, when we went to Dar’s show at the 9:30 Club on April 19 (which happens to be both Dar’s birthday and mine), I thought he might propose. He didn’t, but he did ask me to marry him just two weeks later. When we got married, Dar’s cds were the only duplicates in our music collections (Randy’s was mostly classical, mine primarily folk and rock). So I told Dar all this and she seemed to think it was cute. She said she was glad it all worked out and that she could see we were very compatible. I’m not sure what about us illustrates that, but it must be true. I am blatantly stealing–or borrowing–if you want to be more polite, this idea from my friend Kim. She blogs at bloomingboy and she’s the one who encouraged me to take on this challenge of blogging daily in November (which I’ve technically already failed, but I feel like I should persist, just for the practice) so I feel confident that she won’t mind. I was extraordinarily fortunate to have had an outstanding public school education from kindergarten through graduation from high school. I attended good schools and had, for the most part, great teachers. There were a few teachers who particularly stand out as having significantly influenced my growth and development as a writer. I remember little about second grade except that I wrote stories. Their covers were made of wallpaper scraps and I don’t recall the contents, but I remember writing them and being proud. In sixth grade I was in a wonderful class filled with many very nerdy kids (including me, as I’ve previously acknowledged) and we had so much fun. We did a lot of improvisational theater and public speaking and writing stories using vocabulary words and I loved it all. Mrs. Hansen was very encouraging of my writing and pushed me to do more. I always knew I wanted to be a writer, but that class and Mrs. Hansen’s nurturing definitely cemented my ambitions. I was doubly blessed in 8th grade by a fantastic English teacher and an inspiring speech and drama teacher. It was about this time that I started reading the same novels my mom was reading. I remember doing a book report on The Prince of Tides by Pat Conroy, which is filled with violent and sexual situations, not to mention plenty of other mature themes, but I devoured it. I also wrote a review of the movie The Big Chill because I was 13 going on 35. At the top of the paper, which I typed just because I could, Ms. Mathews wrote “never stop writing” and said something about developing my gift. I felt anointed. Similarly, in speech and drama we had to write stories every week and the class voted on which ones were worthy of being posted on the bulletin board. As often as not, mine were up there and one time a classmate read a story she had written that more or less plagiarized one of mine. I was kind of upset until I realized the teacher understood what had happened and it was actually misguided flattery. Sometime that year, in a moment of adolescent impetuousness, I tore up my application to the magnet high school most of my friends were planning to attend, worried that I would struggle with its science and math focus since I hated both subjects. So I ended up at a different high school, where I was miserable save for a young man who was my first boyfriend, and the literary magazine. Then I went to my neighborhood high school, where I was a big fish in a small pond, had three very different but equally excellent English teachers, and had the opportunity to edit the literary magazine and the newspaper. My writing got a lot of love and I fell more in love with writing. So thank you to all my teachers who guided me lovingly along this path and to all teachers who ate nurturing their students in whatever their passions are. I was not into fantasy fiction or sci-fi when I was a kid, and I was suspicious of people who were. I equated fantasy lit with Dungeons and Dragons, which I thought was hopelessly geeky. Not that I wasn’t a nerd myself–I definitely was. But not that kind of nerd. And I apologize to all my friends who were D&D aficionados once upon a time and I will say I’m more mature now and will not make fun of you. The reputation of fantasy has changed dramatically since I’ve been an adult. Since the advent of Harry Potter and Twilight (yes they’re in the same sentence, whether or not you think they deserve to be), fantasy has gone mainstream. Certainly not everyone lined up at midnight to buy the newest Harry Potter books, some replete in wizard robes and hats, with wands at the ready. But with more than 400 million copies of the books sold and movies grossing tens of millions of dollars, I’d say it’s a fair amount of people. The Twilight series, though not as well-written and perhaps popular as much for the aesthetic appeal of the movie actors (I’m Team Jacob myself) as the storyline, has been similarly successful. Harry Potter was probably the fantasy gateway book for me, accessible because it’s also a young adult book (another genre I love that has become increasingly popular among full-fledged–if reluctant–adults). And I’ve become more open to the rapidly growing fantasy catalogue because my husband is, and has long been, a fan. Please note that I still refuse to read or watch anything related to the Lord of the Rings, although it has produced so many common cultural references, I feel like I should, just like I took a class on the Bible as literature in college. He introduced me to Philip Pullman‘s compelling His Dark Materials trilogy, which delves into challenging questions of religion and philosophy as much as it explores fantastical worlds. So I was intrigued today when I heard on NPR an interview with ND Wilson, a fantasy writer I didn’t know, discussing the first book in a series he’s written for young adults. The Dragon’s Tooth is set not in a castle in England, but at a roadside motel in Wisconsin. Wilson said he wanted to create a book that American kids could relate to, that was fantastical but also grounded in a reality more accessible than the damp and chilling atmosphere surrounding Hogwarts or Narnia. Wilson said his characters Cyrus and Antigone are not magical because they are imbued with special powers but because they work hard to figure things out. They learn Latin. I’m guessing this book is pretty nerdy in its own way. And it sounds awesome. Something I’ve always struggled with is worrying too much about what people think of me. Not just people I know or family and friends, but anyone. I realize this is not necessarily a constructive characteristic, and I’ve tried to overcome it, but some traits are particularly tenacious. Unfortunately this has extended to worrying too much about what people will think of my child. I worry that people will judge her or mistreat her or think badly of her because of something she does or doesn’t do, or because of something I do or don’t do. Specifically, I worry that people will hold it against her that she has this maddeningly persistent bladder condition. And I am constantly mad at and disappointed in myself for caring about this. The thing is, if she had asthma or scoliosis or lactose intolerance, it wouldn’t be an issue. We would just deal with the issue, explain it when necessary, and move on. But because her bladder condition is related to toileting and constipation and pelvic muscles and potty training, it’s more complicated than that. Because her condition doesn’t really have a name, like such and such disorder, it’s more complicated. Because her condition ended up a national news story that demonstrated how completely misunderstood it is, it’s more complicated. So I just want it to go away. But it hasn’t. We have been to many doctors at some expense. We have tried physical therapy and various medications. We have Zoe doing exercises every night. We’ve had her blowing into balloons when she sits on the toilet. We have timers in the bathrooms. We have tried so many things so many times. For a while during the summer she was getting better–she would go four or five days without an accident. But we tried a medication and she had bad side effects and it got worse again. So now we’re back to having about an accident a day. This is despite the fact that she uses the bathroom eight to 10 times per day. She goes when her watch goes off, and sometimes when she gets the signal that she has to go. But most of the time her body lets her down, and her bladder spasms without warning. She is doing everything she can. We are doing everything we can. And yet. So it’s a struggle not to let this issue grow larger than it already is. Zoe is an amazing child. She is kind, funny, empathetic, creative, imaginative, and smart. Today with my mom she suggested they have a picnic in the back of the minivan. She played with my dad at the playground and said she was pregnant with 10 babies and that she was getting an ultrasound, which showed they were all girls. She initiated a conversation about what it means to be surprised and asked everyone for examples of things they’d like to be surprised by. And she created a game of comparisons, taking turns asking Randy which of two things were tastier, or larger, or lived longer, and answering his comparative questions. She sat beside me in the bathroom last night while Randy put medicine on me and she held my hand and patted my leg and reassured me. She promises to do the same when we get flu shots together tomorrow. We are spectacularly lucky that she is such a great kid. Which is why it makes me feel that much more awful when I pick her up from school or my parents’ house and see that she’s wearing a different outfit than she had on in the morning, because she had an accident. I know it’s not her fault. And I want to not think about it anymore or worry about it or wonder whether people will think she is somehow defective because her pelvic floor muscles can’t relax properly. I just want her to be better. So living with the problem, while still trying to help resolve it, is my struggle. She deals with it much better than I do. I should take a lesson from her. The Indigo Girls have been one of my favorite groups since I was in 9th grade and my friend Jenny Prim, with whom I was a candy striper at Fairfax Hospital, gave me a mix tape that included “Blood and Fire,” from their 1989 eponymous cd. I’ve seen them perform live dozens of times in the US and once in London during a show that ended up being part of their live cd 1200 Curfews. I saw them once in the intimate setting of Wait Chapel at Wake Forest when I was visiting my sister while she was in college. I knew my sister really loved me because she bought tickets for us even though she really doesn’t enjoy their music at all, and used to make fun of me for listening to them. I saw Emily Saliers, one of the two Indigo Girls (the other is Amy Ray) and her dad at the National Cathedral talking about music and spirituality. I am a fan. I love their poetic lyrics, the well-knit harmonies, and the feeling that washes over me when I listen to their music. Not until now, however, have they written a song that I feel describes me. Their newest cd, Beauty Queen Sister, includes “Birthday Song.” I have often been characterized by my genuineness. Some people appreciate that I am a what-you-see-is-what-you get kind of person. Some people disdain this trait. I had a former boss who mocked me for being completely “without guile,” which he saw as a problem when I was trying to write marketing copy. A friend giving me dating advice said I needed to be more mysterious and not so obvious. For better or worse, I am obvious. I am not subtle and not mysterious and I am a terrible liar. Whether you think that’s a weakness or a strength, that’s why I am and I am unapologetic about it. Thankfully, my husband does appreciate my authenticity, and he says it’s one of the main reasons he married me. So when I heard this song, I felt like it was about me. Like the person you know me to be. I, however, had more subtle opinions about the camps. The first camp of the summer was two weeks of fun at Zoe’s preschool. It was pretty much like school, but in a different classroom and some different kids and it was generally more relaxed. It was great. The next camp was a week of Ballerina Princess Camp at Perfect Pointe Dance Studio. Zoe enjoyed dancing. She learned the basic ballet positions and their actual names, which was more than I could say for the ballet class she took last winter. They made ballerina princessy crafts and costumes. They colored a lot of xeroxed pictures of princesses. They had goldfish and water for a snack. I’m pretty sure they learned about Swan Lake, but the music at their 15-minute recital was from The Little Mermaid. It was fine, but I wasn’t terribly impressed. Camp Number Two was two weeks at the Arlington Arts Center. This is a very cool place where I would definitely return (and sign Zoe up for more camp or other classes). Zoe created a multitude of incredibly interesting art using a wide variety of materials, some of which I would not have expected them to hand over to four-year-olds. AAC offers three classes a day, beginning at 10am and ending at 4:30. In between classes, teenage counselors play games like telephone and ghost in the graveyard with the campers. Zoe was amazed that I knew those games and had played them myself. There’s also a playground out back, but most of the days Zoe was there it was 100 degrees and they had to stay inside. Next came a two-week session at Congo Camp, run by the Congressional Schools of Virginia. On the first day, arriving at Congo Camp felt like I was taking Zoe to college. It’s a huge operation with what seemed like hundreds of staff and thousands of kids, all wearing tangerine, lime, and white t-shirts. They’re extremely organized, which I appreciated. They gave Zoe a hot lunch every day, which was awesome and saved me the trouble of packing one. Zoe got to swim every day and ride horses (well, ponies) for the first time. And she made a wonderful friend named Bobby from whom she was inseparable for the whole two-week session. The only downside to Congo Camp was because it’s so big and because of the way they organize drop-off, I never got to meet any other parents, which was important only because Zoe wanted to have a playdate with Bobby, which never came to pass. The other thing was they lost her sandals. I guess technically she lost them, but she’s four and they’re grown-ups so I thought they would have kept an eye on them on her behalf. But she had a great time there and I felt like she was well cared for. And the camp goes until mid-afternoon, with optional aftercare, so it’s great for working parents. Zoe returned to Perfect Pointe Dance Studio for a week of Dance My Way. We had already signed up for it, and it was fine, but again I wasn’t wowed. Rounding out the camp experience was a two-week session at Synetic Theater. The first day at dropoff was total chaos. We didn’t know what was happening or where to go and I couldn’t tell for a while who was in charge. I was immediately skeptical. But the second day when I dropped her off, every adult there seemed to know her name and be happy to see her. So I was convinced that they were a bit more together than the initial impression indicated. There’s also a large age range in the classes there, and Zoe’s class included four- through six-year-olds. I think she was the youngest kid, and there’s a big difference between four age six. But the art teacher assured me Zoe was holding her own, and the camp director, at the end of the last day, said Zoe was the cutest thing he’d ever seen. 🙂 They did a play that included every single kid, which was ambitious and fun and surprisingly good for something that was produced in two weeks. Zoe learned choreography and words to a song that she performed on stage with her class and the big kids. She made some very cool art work as well. I think overall Synetic was a success and I would consider sending her back there. The only downside is that they offer an afternoon session, but only when you’re seven years old. That’s a long time away for us. It’s the middle of fall now and summer has receded in everyone’s brains, but I’m already thinking about winter camps, and whether I’ll sign Zoe up for any days where she can do something more interesting and messier than what we have to offer at home. I’m not quite ready to sign her up, but at least now I’m better informed about camp and know what to look for when I do.